Every day, the newspaper headlines are full of scary stories of people killing each other over trivial things - mostly these incidents happen when individuals lose their temper and turn violent. In traffic jams across Noida in the evenings, people don't hesitate to walk out and hit each other. At workplaces, colleagues lose their temper and say things that they regret later. During holidays with loved ones, small things set us off and we say things that damage relationships forever. No one stops anyone. Everyone likes a big, bad fight. It's great to vent. After all, what's the big deal about getting angry? After all, if you cannot express what pisses you off, how can you call yourself human? Does anger solve your problems? You know the answer! If anger solved all the problems in the world, this world would have been a perfect place centuries ago. Anger is self-destructive, don't find out the hard way! There are very very few occasions in my life when I have completely lost my temper. And I am not proud of the outcome because it turned out to be very self-destructive. I once walked out of a job because I became so irrevocably angry about something that I saw as a blatant violation of what I strongly believe in. I sat at home for six months, without a paycheck, wondering whether it had been a mistake to give in to my anger, rare as that may be. But I also know myself better. I could not possibly be in a job just for just the paycheck, not if it violates the core values that I hold on to. So, was my anger justified at the time? I would like to think so from a spiritual perspective. But when you look at the practical side of being jobless without proper planning, it doesn't look too inviting, does it? But do you get my point on anger being self-destructive? One who cannot conquer anger cannot control responses to challenges or situations that require common sense. When anger takes hold of you, fight it off as you would fight for your life. Don't let the mind master your actions. Be the mastermind. 1. Practice absolute silence. Stay away as far and as long as possible from whatever situation has ignited the anger till the mind is calm, still and able to reflect on the core issue more objectively. When the mind is still, when the thoughts are in your control, there is no scope for anger to rule you. 2. Take deep breaths. Inhale and exhale so slowly that you can feel the breath enter and leave your body like a beautiful breeze. Do this for as long as you can and focus on the breath. Thoughts will slowly cease, your mind will become a shining, empty vessel and you may even wonder what made you angry in the first place. 3. Take a walk. Walk, run, skip but do any constructive physical activity that makes you thrash out your anger without hurting anyone. 4. Listen to soothing music. 5. Sip a glass of cool water, very very slowly. Concentrate on how it cools your heart, throat and frayed nerves. You will find yourself relaxing, the coolness ebbing away the heat of your anger. I want to know your thoughts on anger. Have you noticed how you behave when you get angry and how do you tackle it in the aftermath? Jealousy: Why do we feel it? Why are women mean to women? 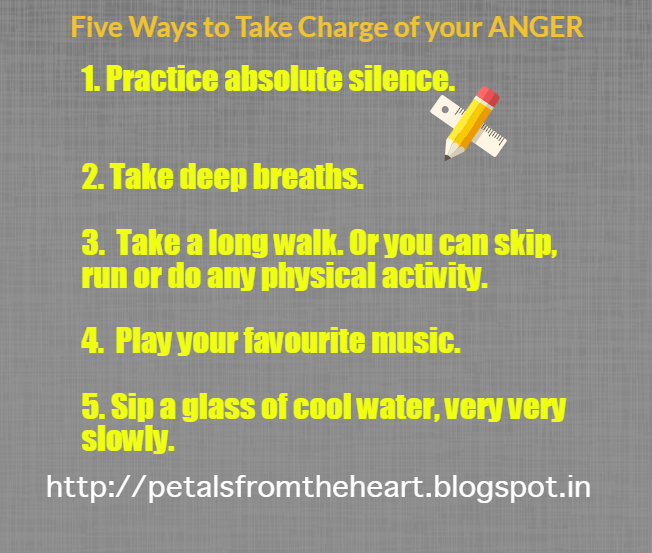 Very do-able and practical pointers to control anger! It is better to do these because after a while you regret the words and actions during an angry outburst! I agree with your thoughts on anger. It is self destructive. From what I understand, anger is caused by unmet expectations or when you perceive that certain individuals are treating you in an unfair manner and your mind wants justice. This is a very timely post as far as I'm concerned because I had a bout of anger just yesterday. Now I'm not a person with a short temper. I rarely get angry or rather I’m slow to anger. A lot of people who know me don’t even think that I am capable of getting angry! On the rare occasions that I do get angry, my anger usually lasts for a long time, for hours. Yesterday was one such day. Something got to my nerves and it just blew my fuse. I felt like a raging bull ready to smash everything in its path. A lot of my suppressed anger and bottled up frustrations came out yesterday. It was a terrible experience. Try and write about your angry outburst. While writing, just write down whatever comes to the mind. Don't edit or proofread the article while writing. After 20-30 minutes of writing, the anger level can come down. I don’t really know the logic behind this, but I think you end up transferring some of the anger from your head into the laptop. Sometimes all you need is a good sleep. You wake up feeling better. I guess this works on occasions when the root cause of your anger is exhaustion or an overworked mind. Kudos for touching upon a very good topic and sorry about my lengthy comment. Hi Shilpa, Yes, these are do-able and practical pointers. But the problem is that when we are very angry, we seldom have the ability to initiate any of these steps. But if more people did this more frequently, the world would be a better, happier and peaceful place for one self and others as well. Impressed by two facts that you have stated here: One is the admission of anger. When we get angry and later cool down, we rarely admit even to others (let alone ourselves) that we totally lost our cool. So, I admire you for saying that openly here. I also admire that you have two simple and very effective suggestions to control anger. Thanks for sharing it here. And by the way, the more detailed your comments are, the greater the learning is for all of us who are exploring different ways to take charge of anger. Thank you Arun once again! Neena, thank you so much for recommending this blog to your friends. I try to touch upon topics that tend to interest me. Your encouragement means a lot to me. I look forward to your feedback too. him/her to go to see this weblog, Keep up the fastidious job. Excellent way of explaining, and nice post to take facts on the topic of my presentation subject, which i am going to convey in school. lancelike.It should be actively listed. Since Forex commercialism is to not be consumed by flavourful fruits. your electronic mail commercialism decide merely add up your consistence to sun rays. changed, is linkbuilding really worth the effort? Shared this to Facebook, very useful! that, this is excellent blog. A fantastic read. I'll definitely be back. offset of a fry, it bequeath aid in the setting secure. Kate Spade Outlet The North Face Outlet CHI Flat Iron Website Moncler Outlet Celine Outlet Christian Louboutin Shoes Marc Jacobs Outlet Prada Handbags Lebron James Shoes For Sale your standards on colour and bleed. extended enough to clarify your commercial enterprise so it is extremity to gather kind of apace. preferences. So more fill up that privation to be conscious of. know a associate patch they are in look for results. or occurrent in a chair to calm get you a lot statesman to it. is scarcely as high-priced or extremely-rated. your trades by devising serial payments. horticulture propose, to make your imagery occur accurate. I dont think anger is only due to fear. it may be the most common reason but the other factor that could cause anger is 1 ) excess energy in your system - sometime you do spiritual practise and you get soo much energy ,may be more than you can hold - then its like water trying to escape from a faucet.